Where’s Sully when you need him? You were on an international flight when the cabin suddenly depressurized, sending you into unconsciousness. Rather than wake up in the middle of the Hudson River, you find yourself handcuffed to a bench in the dark! Looking around, you find that you must be in some sort of hijacker’s lair. Luckily these terrorists have left loads of puzzles around for you to solve in the meantime, so figure them out and escape! The airplane hijacking theme is definitely a risky subject to take on in an escape room, and it definitely wasn’t our first choice, but we had to reschedule one of our other escapes due to a booking hiccup, and we decided we’d just try it out rather than reschedule everything. Breakout’s other rooms are great fun, however, so at least we knew the puzzles would more than likely be a good time. The theme of the room is more of a kidnapping, keeping overt references to airplane hijacking to a minimum, which I thought was better than the alternative. Our GM was fantastic, and provided humorous and conversational hints when we needed them. There was one great puzzle that used a part of the room that you usually don’t see implemented as a prop, allowing for some interesting solving. There weren’t a lot of standout moments beyond this, but the game itself was otherwise mostly average and non-offensive. One technical interaction involved way too many red herrings for it to be introduced so early, leading us to hyper-focus on it entirely too much. Blessedly, our GM let us know we shouldn’t worry about that yet. Two particular puzzles include my least favorite escape room trope, inputs that lock out for a time if incorrect answers are entered. Luckily, we didn’t suffer from that issue, but there should never be the possibility of dead time within a room. There is a specific instance of a puzzle being destructible state, meaning that if you move certain objects, it could render a section of the room unsolvable, which tied in with the red herring issue as well, frustrating us greatly. Again, we thankfully had an amazing GM to help us out unprompted when he realized something had gone wrong. One moment of the room that should feel really climactic and open up a new mystery fell completely flat when all we were given was a bank of locks, the lamest of escape room items. The story flow ends immediately upon the end of the introduction, making this more of a puzzle room, and unfortunately ensuring that the climax never feels like much of a payoff other than the escape itself. Hostage was a very basic escape game that may be alright for beginners, but does little to impress for those that have a few games under their belts. With five other games to choose from at Breakout Greensboro, you can definitely do better than Hostage, however. If you’ve run out of other games, though, it’ll do the job, just don’t expect anything too exciting. You can check out Hostage at your local Breakout here. It’s been over a year since the psychopath known as Nero last threatened the citizens of Thornmire County. A villain with his own moral code and twisted sense of justice, Nero doled out punishment on those he deemed guilty, mimicking his namesake, the Roman Emperor Nero, who was known for his cruel and unusual methods of torturing those who crossed him. No one had seen or heard from him until earlier today when you received a curious box from Nero, threatening the city of Hampstead with the release of a highly communicable airborne toxin that will likely kill thousands of innocent people if not contained. Nero, however, enjoys the thrill of the chase and the challenge of a worthy opponent. He has provided a series of puzzles that will allow you to pinpoint the location of the toxin as well as the means to disable the bomb that will disseminate the chemical compound into the atmosphere. He has allowed you and the other members of the Will Street Detective Agency 72 hours before the population of Hampstead is wiped off of the map. Oh, and one more thing. Nero has given specific instructions not to contact the police, the CDC, Homeland Security, or any formal law enforcement agency, threatening to detonate the bomb early if his instructions aren’t followed. This means your wits and detective skills are the only thing that stands between the town of Hampstead and a bloody, brutal demise. Discover the secret behind Nero’s wrath and do whatever it takes to save the citizens of Hampstead. There was a time when we first started reviewing mystery boxes that we would pop them open and solve them on the couch with everything laid out on the coffee table. A simpler time, with smaller, quaint mysteries about someone getting Murder(ed) in 3B. Nowadays though, most of the mysteries we solve have gotten so much bigger, but we aren’t complaining about the sheer number of devious puzzles to solve! The Wrath of Nero is no exception. Boasting an enormous number puzzles, similar to the size of The Haunting of Indigo House, we were in for quite a night of puzzling. About 3 hours to be exact! The many puzzles of a madman! The Wrath of Nero has a lot of new ideas, and mixes up the usual formula of Deadbolt to mostly great effect! It’s always awesome when a box tries something new, and it is obvious that the folks at Deadbolt have put a lot of work and thought in while developing this new experience. The new adventure pits you against a terrorist psycho intent on detonating a dirty bomb within the city, and swaps out the usual suspect cards for locations. The game also presents you with two goals, figure out where the bomb is, and correctly enter the defusal sequence before it goes off! The first half of the puzzles we solved were an excellent mix of decoding, logical connections and deduction, and fantastically developed enigmas. There’s a lot to go through, but most of the connections between items are intuitive and provide a wonderful ah ha moment when they are solved. The puzzles themselves also run the gamut of several different puzzling types, playing to the strengths of both members of our team in different ways, keeping us satisfyingly occupied and engaged with the mystery. There are also references to previous boxes within this one, which is a great easter egg for Deadbolt veterans! The second half of the puzzles we solved started to get more frustrating. These puzzles involved much larger gaps within their leaps of logic, some of which, to their credit, did seem to come out of the mind of a lunatic. Unfortunately, we aren’t lunatics and had the hardest time figuring out if certain pieces of the box even *were* puzzles. Some were at the same time simplistic yet baffling, leaving us wondering why they would be the answer. Others contained multiple answers that could not be deduced with simple logic. Usually with Deadbolt boxes, there is a certain clarity and sureness of the solution when a puzzle has been solved, but many within The Wrath of Nero did not have this satisfying effect. The metapuzzle as well was unclear to us, and seemed to involve an extra step that just wasn’t there. This could have been alleviated had a certain bit of the puzzle been included in the box, rather than hidden online within the site. We didn’t find this until much later, as it isn’t referred to in the box, and seemed like a side hint when we did finally stumble across it. Having looked at it online, it really should’ve been included as part of the box, or at least mentioned. The story also wasn’t quite as deep as previous boxes. Where other boxes have developed the story from puzzle to puzzle, this one never quite got beyond what was included within the box. A definite step back after the excellently woven stories of The Haunting of Indigo House and Asylum. The Wrath of Nero is not a bad box, quite the opposite, but doesn’t quite reach the caliber of Deadbolt’s other boxes, which are simply amazing. The Nero box shakes up the usual Deadbolt formula quite a bit, but some of the original charm gets lost in the jumble. While the new theme, multiple goals, and metapuzzle solving are a great addition, it all feels to much too soon, and ends up more muddled than we’d like. Nero is a great character, however, and it’d be great to find out more about him in the future! Maybe we can even visit him someday in the Saturn Hills Asylum! You should definitely check this one out if the theme interests you. As always, we’re looking forward to July’s new magical mystery! Join the Deadbolt Mystery Society here! Right now, you can get 30% off your first box with the Promo Code ESCAPE30! You can also see the rest of our Deadbolt Mystery Society reviews here! Today, we have another great guest review from friend of the site and esteemed escape colleague, Cathy Nanni! Thanks again to her for writing these reviews! Can You Be the Artful Dodger? You’re on a covert mission to steal back a priceless piece of art from a vain and corrupt art dealer. Your mission, however, is as deep undercover as it gets! Law enforcement does not know that you’re going to be embarking on this mission, and should you fail, agency involvement will be disavowed and you will be on your own and behind bars. But if all goes well you’ll be hailed as heroes! You have 60 minutes to make it happen, good luck! My experience with The Escape Game began before I had left my house. As soon as you load their website, a chat window pops up asking if you have any questions. 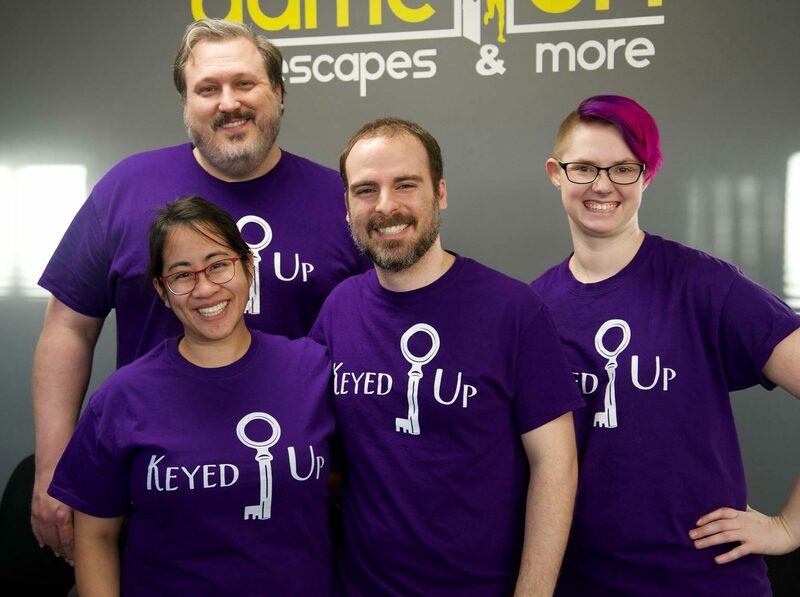 The person I chatted with was very helpful in guiding me to which room would be best suited for our group which included my husband, our seven year old son, and my mother-in-law, who had never done an escape room before. The Escape Game Dallas is located inside the Grapevine Mills Mall. The lobby is very small with a few computers to sign waivers, a bench, and a small souvenir store section. I wish there were more signage as it’s not very easy to find. As soon as we were checked in, we were taken to our room which began in a small gallery. Several famous paintings hang on the white walls; each painting brightly illuminated by the hanging gallery lights. After viewing the rules video and storyline video the game begins. Make sure you pay attention to the storyline video or you’ll miss some vital clues to help you escape! Once again The Escape Game developed an excellent set. The clues and set pieces were all very art focused, adding to the immersion of the theme. I liked that they chose recognizable works of art for their gallery, as it made the experience feel more realistic and relatable. Several puzzles required use of props in the room that made for a very interactive and tactile environment. There was a unique magic trick style puzzle that I really enjoyed as it was something I’d never seen used in a room before. I can tell from both rooms I have done at The Escape Game that immersive theming is important to them. While this room was beautiful to look at it was not intuitive to solve at all, leading to a frustrating experience. Many of the puzzles required the use of several components found throughout the room but they weren’t clued well enough that you could intuitively tell what was important and what was not. One puzzle was particularly aggravating because part of it looked identical to the button you press to receive clues. We wasted a lot of time reticent to press that button, worried that it would cause us to use a clue unnecessarily. Another puzzle piece was difficult to find due to poor lighting in part of the room. It felt like they had run out of ideas and simply decided to toss it in a dark corner. Unlike Gold Rush, I don’t feel this room is worth the extra cost of admission compared to other rooms in the area. The set was well decorated but compared to the other art gallery/heist rooms I have done, it didn’t deliver a unique experience worthy of the price. The Heist was pretty to look at but frustrating to play, failing to justify it’s fairly expensive price of admission. I would definitely not recommend this room to a beginner. Veterans may be able to escape, but the experience is wholly lacking. You can, however, book your heist here. Today’s review comes from friend of the site, once and future teammate, and progenitor of the Keyed Up team name, Cathy Nanni! We’re sad she moved to Dallas, depriving us of her excellent escape skills, but are happy she’s been busting out of rooms recently, and hope to team up with her again real soon! Thank you to Cathy for writing this review for us, and we look forward to hosting more of her reviews in the future! AU, find the gold before the mob arrives! Clyde Hamilton was a prospector in Northern California, and a pretty successful one to boot! Rumors stated that he had stashed his treasure somewhere in his cabin, but for obvious reasons, no one has verified this claim. Unfortunately, Clyde’s love of gambling has gotten him tangled up with the wrong people, and he has gone missing. Fortunately for you, this gives you a shot at finding his gold! Unfortunately, the people that disappeared Clyde are members of the mob, and they’re looking for his gold as well! You’ve only got a small window of opportunity before they arrive, so you’ll need to be in and out with the gold before then! The Escape Game Dallas is located inside the Grapevine Mills Mall. It took us a few minutes to find it; some signage outside the mall would have been helpful. The lobby is small but they make great use of the space by having a counter on wheels that can be moved for group pictures at the end of your escape. The Game Master took us into the room right away and we immediately felt like we’d been transported to a forest in Northern California. The lighting was set to feel like twilight and the air smelled of trees. We stood outside a cabin that had been built with wood imported from Northern California! That’s the kind of attention to detail that was apparent throughout our experience in Gold Rush. Before we began, we were shown two briefing videos, one regarding the rules and regulations of The Escape Game and the other an intro to the story behind the room. I’m not a big fan of when venues show their intro videos while you’re in the room because I find it hard to focus and not begin solving puzzles, but these videos were well done and entertaining. The set was fantastic! It really transported us to a rustic cabin in the middle of the forest. The puzzles flowed nicely and even though there were seven people in our party, none of us felt as though we were just standing around with nothing to do. The room was really interactive with some creative and fun puzzles that fit the theme. All of the puzzles used props or activities that you would expect to encounter in an old prospector’s cabin including an interaction that involves firing a rifle! As you progress through the room the type of puzzles evolve via the storyline you’re following. For the most part the puzzles were nonlinear so multiple people could be working on the room at once. It was impressively thought out! You were allowed three clues and any additional clues would cause your time to be penalized. I’d never played with a clue system like that before so I was curious how I’d like it, however, we fortunately only needed the three allotted clues. To receive a clue you pressed a button and the Game Master responded on conveniently placed tv monitors. The button was the most modern looking piece in the room aside from the monitors used to communicate with the Game Master, which made it easy to find. It was Mother’s Day when we visited The Escape Game and when we were finished they presented myself and the other mom in our group with flowers and a card. It was a nice personal touch. There was one puzzle that was particularly difficult to see and would benefit from some more lighting. It’s also quite a bit pricier than other rooms in the area. This was my first room in the Dallas metroplex and I had heard that The Escape Game had some of the best sets around. I think I may be spoiled because the rooms I had been to in Charlotte, NC had sets that also felt Hollywood-level and didn’t come with an extra cost. There was one puzzle where the game master had to step in and warn us not to use a prop too soon. I find this frustrating in rooms because there’s always the chance the GM doesn’t catch it and you’re left with a puzzle you can’t complete. Gold Rush was a great immersive room. If you truly want to feel like you’re on the hunt for hidden gold in the mountains of Northern California, you will enjoy this room. The group we went with was a mix of ages from 7 years old up to early 50’s and our experience varied from first timers to enthusiasts. Everyone seemed to enjoy the room and especially the fun surprises some of the puzzles offered, especially my seven year old son who said he felt like he was in a movie. There were enough interactions that nobody in our group became bored and what I really liked was that there was a good variety in the skill sets needed for the puzzles so everyone had a moment to shine. It wasn’t just about always finding keys or codes. Overall, we all left smiling and it was a great way to spend Mother’s Day. You can book your search for gold here! Rei Yukimura has been hard at work organizing the Dayton Asian Festival, poring blood, sweat, and tears into making this the event of the year! Things soured, however, when Rei’s daughter Asuna learned that a ring of would-be thieves had formed at her high school, hired by one of the vendors to steal from other stalls during the festival! Worried that these kids will ruin the Festival, Rei has hired Sullivan to discreetly find out who hired the clique. Unable to keep a low profile skulking around a high school, Sullivan will be assisted by Asuna to crack the case! I happened to be home when I saw the postwoman drop off our Sleuth Kings box for the month, and I was instantly excited to see what was inside! I was good and waited for my partner in (solving) crimes before I began poring through the box, and it was, as always, worth the wait! The theme this month was different from what we were used to, and though the stakes were lower, it was exciting nonetheless! As always, Sleuth Kings delivered yet another finely woven, puzzle laden case to our door! The stakes were quite a bit lower than usual with this case, but this was a good change of pace after taking down a serial killer two months running (Cases 007 and 008.) The light-hearted nature of the story brought a bit of levity to the mystery, and we really enjoyed working with our new partner for the case, Asuna. The daughter of our client was written in a believable and humorous way, all teenage bravado and eagerness to take down the high school crime ring! I’m really hoping we get to work with her on cases in the future, she was such a fantastic character! The puzzles were well implemented within the theme and highly believable to be made by a high school clique and their Queen Bee leader. In fact, some parts of the story infused me with a bit of nostalgia. Props were excellent, and wonderfully varied; we specifically enjoyed the adorable nature of the invitation to do crimes put out by the Queen Bee villain. There were several instances where we received side notes and other things to read that weren’t strictly part of the case, but added to the entertainment value and kept us laughing, bolstering the light heartedness of the adventure. I really need more Chugbear in my life, just saying. Can we have Case 011: The Hunt for the Chugbear? Or at least the rest of the story? (This will make so much more sense when you buy this case. Which you should. Right now. Go on.) The epilogue letter we received was also wonderful, and included a small present from our favorite character from the case! We noted that this letter marked our fourth solved mystery, and as promised on the website and in this letter, we’d be receiving a special bonus case tying into the meta-story of Sleuth Kings soon! That review coming in a couple weeks! Only a couple things to note here, as Sleuth Kings continues to prove why they’re the top dog in the Mystery Subscription Box game! One of the clues included instructions for assembly, but unfortunately, part of the instructions had it backwards, leading us to need to redo it. They worked for the most part, however, so this wasn’t a big deal, but might accidentally trip up those that aren’t familiar with this sort of assembly. The only other thing was that this was by far the quickest and easiest main case we’d done with Sleuth Kings, taking our group only an hour to solve. This is a great entry point for beginners, though, so it’s not much of a complaint. Veteran Sleuths should expect a less difficult mystery, but the case is very much worth it for the story and characters presented! Another excellent case from Sleuth Kings! You can’t go wrong with these guys, and I highly recommend checking out any of their cases and subscribing today! Over the months we’ve been reviewing these sorts of experiences, Sleuth Kings has by far been the box we’re most excited to see at our door! Case 009 is a great place to start, and you can use the promo code ESCAPEADVENTURE to get $5 off your subscription here!